It’s looking more and more like the winter of 2017-18 is going to be a big year for snowy owls in southern New England. Large numbers of the iconic white birds have been observed throughout the Upper Midwest and Northeast since late November, and many have turned up in Rhode Island. Project SNOWstorm, a volunteer-based snowy owl tracking organization, is predicting that the attractive birds will invade much of the northern tier of the United States this winter. Hundreds of birds have already been sighted, including some as far south as North Carolina, Oklahoma and Missouri. Scott Wiedensaul, director of Project SNOWstorm, said it’s difficult to predict how many birds will travel to the area or how long they will stay. “There’s a little bit of voodoo and black magic in all of this,” he told Audubon magazine. But the signs point to it being a good year for snowy owl watching. Rhode Island has so far had visits by at least 17 snowy owls in recent weeks, according to Rachel Farrell, a member of the state’s Avian Records Committee. University of Rhode Island ornithologist Peter Paton reported seeing seven snowy owls on Block Island last week, and local birdwatchers have reported additional owls at Sachuest Point National Wildlife Refuge in Middletown, East Matunuck State Beach in South Kingstown, and along the shores of the Narrow River in Narragansett. One was even photographed perched on a chimney in a residential neighborhood in Providence, and another Providence bird – or perhaps the same one – was spotted at the headquarters of Save The Bay. Just one or two snowy owls usually visit Rhode Island during a typical winter. 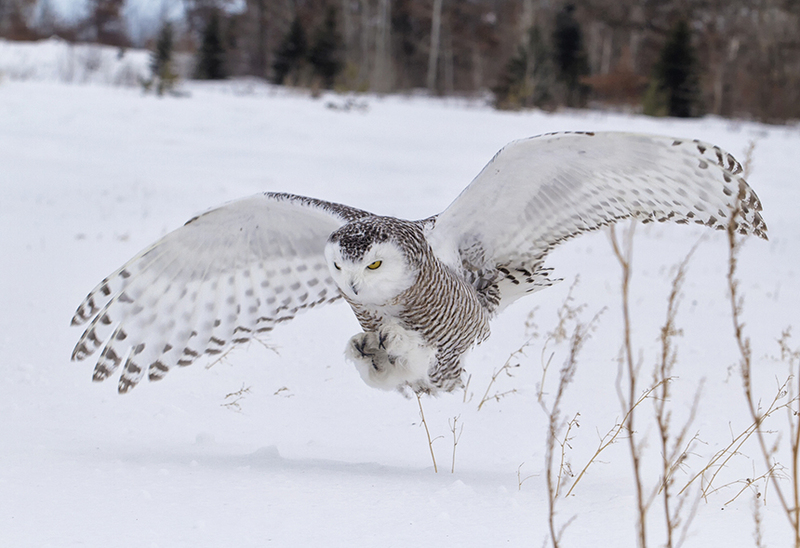 Snowy owls spend most of their lives in the Arctic feeding on lemmings on the tundra. But Farrell said that about every four years, when lemming numbers are high, the owls lay more eggs than usual. Many of the birds that hatch from those eggs end up migrating south in winter after being forced from their Arctic habitat by adult owls because of the reduced availability of food in the deep snow. Canadian scientists have reported that snowy owls successfully raised an especially large number of young birds last summer. This year’s irruption of snowy owls into the United States isn’t unprecedented. Four years ago, the country experienced the largest influx of snowy owls since at least the 1920s, when several thousand owls spent the winter south of the Canadian border. Some traveled to places they had never before been reported, including Jacksonville, Fla., and Bermuda. More than 400 were observed in Pennsylvania alone, a state that seldom records more than 10 in a year. The birds that visit Rhode Island are usually found on beaches, farm fields and airports, which mimic their tundra homes, where they also search for mice and voles. Owls that spend time in coastal locations often hunt for wintering ducks, something they don’t often eat on their breeding grounds. As exciting as it is to see a snowy owl, they can also be a nuisance and a safety hazard at airports. Paton and fellow URI professor Scott McWilliams will attempt to capture and relocate any owls that show up at Quonset State Airport and other undesirable locations this winter. The large number of snowy owls visiting the area isn’t necessarily a sign that the breeding population is growing, however. Farrell noted that the population of snowy owls breeding in North America has declined by about 64 percent since 1970, though scientists aren’t sure why. Unlike so many other rare birds that occasionally turn up in southern New England, snowy owls are easy to identify. Weighing in at about 6 pounds, it’s the heaviest owl species in North America, and its white plumage and piercing yellow eyes make it unmistakable. Adult males may be pure white, the perfect camouflage for a bird that spends much of its life in a snowy environment. Younger birds are much more visible, with contrasting gray barring on their white bellies and wings that make them stand out as they perch on fence posts, beaches and snow-covered fields. The Audubon Society of Rhode Island advises that those interested in going in search of snowy owls should bring along binoculars or a spotting scope and stay at least 200 feet away from the birds, as the owls can be skittish. It also recommends staying quiet and refraining from making sudden movements that may frighten them. The owls are already rather stressed after their long migration and their efforts to find food in unfamiliar places, and rambunctious humans will add to their stress.